Peace Arts Gallery Society’s thirty-fourth Annual Art Auction is destined to be an unforgettable event celebrating our community as well as the arts and culture of the Peace Region. PAGS is pleased to announce that this year’s fundraiser will once again take place at the Pomeroy Hotel, opening at 6.00 on Saturday, September 30th. The Art Auction is an exclusive look at specially selected, original artworks created by local, regional and national artists. We are pleased to present 60 outstanding works of art with a silent auction on display throughout the night and an exciting live auction program that begins at 8:00 pm. Funds raised at this event enables PAGS to support Peace Gallery North operations and exhibits, children’s art programming, the giving of student bursaries, community and North Peace Cultural Center art initiatives and more. To ensure this is our most exciting and successful event ever, a PREVIEW EXHIBITION at Peace Gallery North of all of the works on offer at the event during the week leading up to the auction. The evening begins with a Cocktail Hour and viewing of the original artwork from 6 – 7 accompanied by live entertainment. A scrumptious 4-line buffet, as only the Pomeroy Hotel can deliver and including complimentary wine will conclude with an assortment of desserts, coffee and tea. Tickets are $75 each available at the North Peace Cultural Centre Box Office. Call the North Peace Cultural Centre at (250) 785-1992 and speak with reception to purchase your tickets over the phone. Tickets may also be picked up at the door the night of the event. 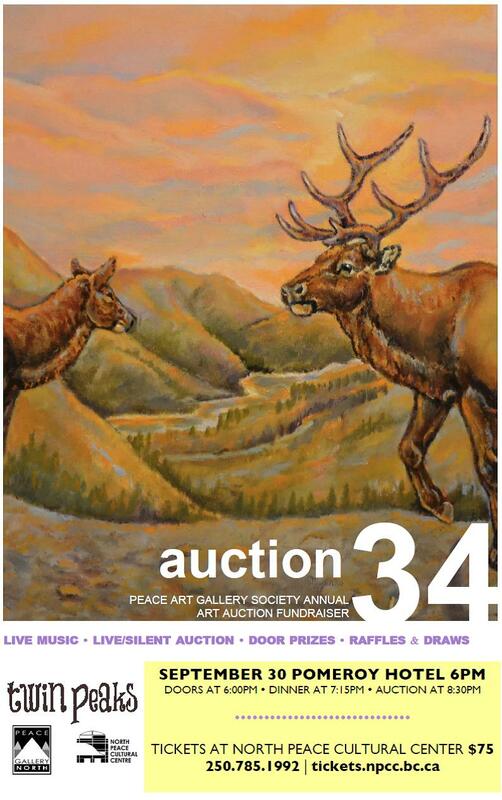 Peace Gallery Arts Society, the North Peace Cultural Centre and Peace Gallery North hope that you will join us at the 34th Annual Art Auction. It’s sure to be a night to remember!